I do my best at Fried Neck Bones…and Some Home Fries to keep you informed on vital gastronomic matters here in New York and around the globe. 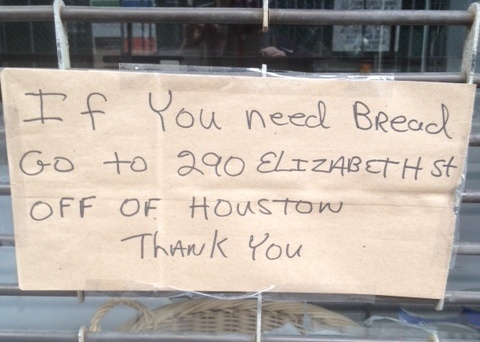 For anyone in need of bread, I came across this cryptic message. As I research this developing story, stay tuned for further bread updates. That is next to one of my favorite bars (Tom and Jerry’s). I can vouch that the bread the sign is referring to is good. I don’t want to spoil your surprise so I’ll avoid mentioning the name. Where did you see the sign?